Happy birthday to you! 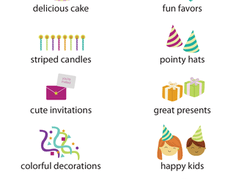 Make someone's special day with cake, balloons, and one of our Birthday printables. From DIY invitations and cards to decorations, these fun, colorful worksheets give kids a variety of ways to celebrate their birthdays. For more crafts, cards, and gifts to celebrate turning one year older check out our collection of Birthday activities. It's a word search celebration! See how many birthday words your child can find in this word search. He'll practise spelling as he hunts for each one. On this birthday-themed year three reading worksheet, kids circle the adjectives and underline the nouns. A Cut-Out Birthday Card Surprise! Challenge your child to a cut-out contest with this printable, a birthday card cut-out that pops out in 3-D! Making your own greeting cards? Why not make your own envelopes too! Its easy with this handy template. Celebrate a friend's birthday with a homemade banner! Spell out a name, or "happy birthday" using these templates, a perfect hand-crafted decoration. Birthday time rolling around again? These colour-your-own invitations will let everyone be creative while saving you time and money! Lighten the load of party planning a bit with some sweet cupcake birthday invitations! Planning a party can be stressful, so equip yourself with quick and easy printable birthday invitations! Send birthday wishes with a homemade greeting card! Your child can colour this template, fold it up and send it to someone on their special day. Got a birthday coming up? Show that special someone you really care by making a homemade card with this cute printable! Celebrate a special day for your little princess! These printable princess party invitations are perfect for planning her birthday party. What is more fun than coloring? Birthday parties! With these fun printable invitations, your little one can have both. Say "Happy Birthday" the creative way, and colour a homemade card for someone on their special day! Every little princess deserves a special birthday party! Plan your child's special day the easy way, with some printable princess party invites. Brighten someone's special day with a cute butterfly birthday card that you and your child can colour and decorate yourselves. Throw a fun birthday bash for your little sports star! These invites are easy to print, and will make your party planning a bit more simple. Teach your child about an important part of the holiday or birthday season -- sending thank you cards! He'll get to colour this cute card himself. Anyone would be delighted to receive a hand-colored invitation to a birthday party! Have your child help with party planning by using this fun printable. Be it birthday, Christmas or Easter, be sure to give thanks to those friends and loved ones who made your day special! 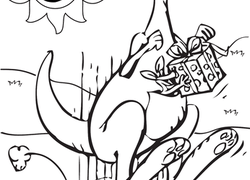 This coloring page features a couple crazy kangaroos on their way to a birthday party. Got a birthday coming up? Wrap that special something in this unique and colorful balloon wrapping paper that you can print from home.